More Great Games for New Players! Fergal here! Let’s get this train of thought moving! 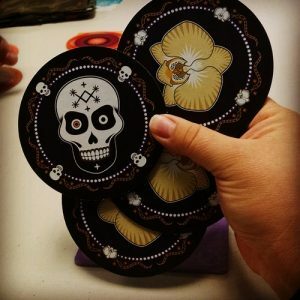 This is the second in a series of posts about Great Games for New Players. 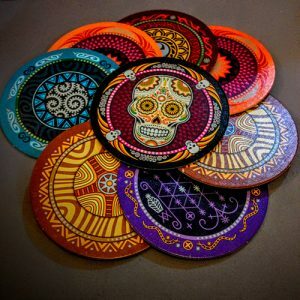 You can find the first one here, written by the charming Eoin Murphy, where he talks about Zombie Dice, One Night Ultimate Werewolf and Love Letter. The question then is how do you show them that there is so much more to gaming. For that you need some gateway games. Most of these are party games, while some have a little more to them. The key things are that they should be simple to explain, be mostly understood after a round of play, and if the game is longer than 10 minutes long, not be too punishing for making mistakes in the early game. Let’s start with a game that does all these things well. Look at how beautiful Skull is. Each player gets the four tiles and mat that match their tribe. Three of these tiles have a rose and one a skull. At the beginning of the game, every player plays a tile face down on their mat. On their turn a player may play another tile on top face down or make a challenge (start the bidding). Though once someone has made a challenge (bidding starts), no more tiles may be played. A challenge is claiming that you can flip X tiles without hitting a skull. Each other player has the option to pass, or make a new challenge. (Which has to be higher). If you pass it’s basically folding and you can’t make a new challenge later in that round. Once a challenge goes unchallenged, the challenger has to try and cash the cheques his mouth was making. (Try to flip X tiles without hitting a skull) They have to start with their own though, so if they have a skull they are out of luck. If you succeed you get to flip your mat (Score a point). If you win two challenges you win the game. If you fail you lose a tile. You get to choose if you hit your own skull, and it’s randomly picked by the other player if you picked theirs. Either way the tile lost is secret to other players, and remains hidden. The other thing the game has, which I really appreciate, is depth. You are trying to figure out what the other people will play. “This player always has a skull if they make challenge of two roses.” “This player doesn’t seem to play the skull much.” “This player always plays a skull and never challenges.” Often these observations will be wrong, because other players can be thinking things like, “I am going to do this, until people stop trying, then play flowers,” or “I’ll play only flowers for a while, then throw in a skull.” You can play it safe, or take risks. Sometimes you can even challenge, knowing you will lose a tile, but to try and deny a player from winning the game. In one game I played recently, a player was one tile away from winning and three players had an unflipped tile on the table. We gestured with our hands, as though offering the tile, each seemingly willing the challenger to pick our own one. The challenger chose mine (a mistake) and the table exploded in friendly goading as it was a skull. A side note on Skull in comparison to other similar games, like Schrödinger’s Cats or Liar’s Dice/Perudo, is that in Skulls people do not call your claim, if they don’t think it can be done, they pass. This is really nice for newer players, as in games where claims can be challenged, sitting next to a new player is a huge advantage as they will usually try to raise, or make mistakes on the best time to call. That said, once they are hooked on Skull, these are some games that are somewhat similar. 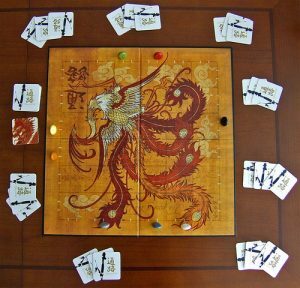 Tsuro is the game of the path. There are beautiful philosophical ideas behind the game, about the search for enlightenment as shown in the quote “many roads that lead to divine wisdom”. It’s a 2-8 player game that takes about 15 minutes. On your turn you play a tile from your hand You have to play it in front of your piece. They will then follow the path they are on. (No sharp turns here, you follow the obvious path, even if it crosses other, better paths). You have to move yourself, however if it happens to move another piece that works too. After playing you draw a new one, unless you got eliminated. Elimination happens if you go off the edge, or collide with another player, which also knocks them out of the game. The last remaining player wins. In the unlikely (but awesome) event that more than one player survives long enough to fill in the entire board (less one space) then they all win. In our playgroup we call that true enlightenment. It is super easy to learn, and you mainly focus on how to use the tiles you know you have to see if you can survive for the next few turns. There are a few play styles. I like to fill in as much of the board as possible, often in straight lines. Others like to just hide from other players as much as possible. Some even like to get close to other players (not too close though) and mess with whatever they are trying to do. Some players try to cut off a corner of the board and hope that the other players will be knocked out, before they run out of space. Eliminating someone else is also super satisfying, especially if you also find a way to save yourself. It can also be fun to watch, as the game often ends with two players in different corners trying to see who can survive that one turn longer. So eliminated players can still have a laugh at the misfortunes of their peers. One danger with Tsuro though is over playing it (which is true for most games under 30 minutes). While strategies do exist, it is not a game with huge depth. It’s better to play it once or twice, and then move on to another game. This is not a bad thing, as it allows Tsuro to perform some great jobs in your games night, with a large player range, simple rules and a quick play time. It’s a great first game (or two) of the night for a gaming group. It gives players chance to settle in, before splitting into groups, or playing something more complicated. 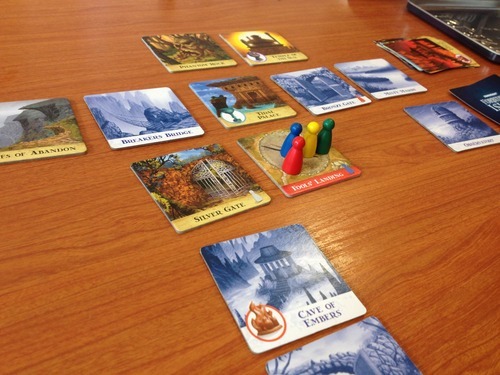 It also acts as a fantastic wind-down game, after a very active or stressful game. Tsuro is relaxing for the first few turns, and then the pressure to survive slowly escalates. 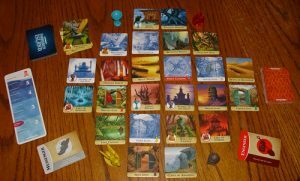 Forbidden Island is a about a group of explorers who go to an island that has risen from the sea, but is quickly falling back into it. Like traditional not-archaeologists they are going to grab all four of its mystical treasures, before it sinks again, back into the crushing depths of the sea. This is the most complicated game in this post, but as a cooperative game with open information it is easy to teach. So the first thing you do is set up the island in the pattern shown. The pattern is the same, but the placement of individual tiles is random. Set the initial water level (this decides the difficulty), flip 6 cards from the flood deck. This decides which parts of the island are sinking. You then flip those tiles to their blue flooded side. You give each player 2 treasure cards (if they get a waters rise, just replace it with a different card, then shuffle the treasure deck.) You also give each player a role, these can be chosen or random. Each role has a power, that changes that piece’s/player’s interaction with the base rules of the game. I recommend the explorer, pilot and engineer for new players, as they can achieve a lot in their turns without being complicated, which is always nice for new players. The navigator and the messenger are great for a more experienced player to play support in the first game. I generally leave the diver out of the first game. Shoring Up, means you flip a flooded tile back to it’s dry side. After doing your 3 actions, you draw 2 new treasure cards. If you have more than 5 you have to discard. One nasty card is called Waters Rise, and it makes everything worse, by increasing the flood level, and shuffling all the cards in the flood discard, and putting them back on top of the deck, so they are more likely to flood again. You also don’t get to draw a replacement, so you are a card down. It’s unpleasant. There are two other treasure cards that are here to help though. They are special actions, they can be played at any time, even on other player’s turns, they do not cost and action, and can really save the day. After drawing cards you flood the island a bit more. You draw cards from the flood deck. If they are dry, they flip to their blue flooded side, if they are already flooded, they sink forever. Both the tile and card are removed. (Any pawns on that space have to swim to an adjacent tile if able. Otherwise they get pulled under and die) Remember Waters Rise means that the discard is back on top of the flood deck, and about to be drawn from. This means that if areas are not shored up, they will probably sink when waters rise. Then the next player has a turn. So how do you lose. There are four fantastically fun ways to fail! Both locations related to a treasure sink before you have a chance to claim that treasure. The water level reaches the skull and crossbones, you took too long and the whole island sinks… with you. Keep playing until you win, or you don’t. 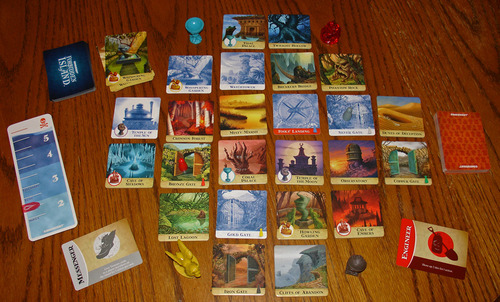 Forbidden Island is one of my favourite games to introduce people to cooperative games. It has a lot going for it, as a gateway to gaming, but also a gateway to cooperative games. It is comparatively simple once play starts. There is not a lot to track to avoid losing. Keep at least one treasure location of each type on the island, until you have its treasure, and don’t let the landing pad sink. There is more, but this is your main focus early game. There is usually something useful to be done, from shoring places up, positioning better, or giving treasure. Three actions means that you can have a versatile turn, but it won’t be overwhelming to figure out either, which is actually great. The earlier difficulty settings of Forbidden Island are quite forgiving of early game misplays, and these can even lead to a very tight dramatic ending, where you just need to hold out for one more round, and you’ll win. This is great, as early disaster in other cooperative games will often lead to the “Maybe we should just restart” moment, which is discouraging in any game. This allows players to not lose hope and try to play through. One problem with many cooperative games is one player telling everyone else what to do, which tends to grate on people’s nerves quickly. This forgiving nature means that experienced gamers should allow players to make their own choices for the most part. Players will enjoy the game more if they have a chance to discover strategies, rather than simply being told them. Now once people get really good at the game, it can get a bit boring. It’s a simple game, which is a boon, but it means you can basically solve it. However this is where the internet is your friend. There are alternate maps available online, which add a new level of fun and challenge to the game, and really breathe new life into the game. It is also a great gateway to games like Forbidden Desert (which is both a little different and a little more challenging) and Pandemic. They are all quite similar having been made by the same people. Pandemic and the other games in it’s family are more complicated, and are a lot more punishing of early mistakes. You are much more likely to lose. In fact, most players play at a difficulty where victory feels like a big accomplishment, rather than something easily attainable. Many people, myself included, really enjoy slowly losing and almost winning at Pandemic. Have you played these games? Do you think they are terrible? Do you love them? 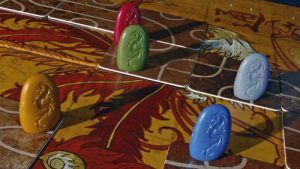 What games have you used in the past to successfully introduce friends to boardgaming? Please let us know! You can do so on social media or by attending the IGA Games Night which is held every Thursday in Robert Reades Bar. In fact, on the 28th of April the IGA will be running a special Introductory Boardgames Night where you will have a chance to introduce your friends to these games and many more!